I liked this show so much, I made my wife come with me to their restaurant from NYC, and we've since been back. Mark and Francis are great hosts, and though I don't always agree politically, they give you an insight into the food world (especially the restaurant business) in a way that's thoughtful and really takes you behind the scenes or to the deeper level of an issue. I would say that if you're a fan of TV shows like Top Chef, you'll like this radio show. I like their sense of humor, and their honesty and passion for what they do really comes through. Highly recommended. Food, wine, and a great podcast! As The Restaurant Guys say in their opening, their show covers food, wine, and the finer things in life, and that it does. Their passion for their work comes through in every show. It provides a unique and interesting look into restaurants, food, and wine, even for those not in the business. Great Podcast, but where have you gone? Did the corn syrup people get to you? Come back, Mark & Francis! You will definitely get insight into the restaurant business. They talk to interesting people and the occasional wacko...but every now and then, their podcast sounds like they were recorded using a cheap microphone across the room from a radio broadcasting their show. As a listener of WCTC and The Restaurant Guys it is great to have this show available on iTunes. Having the ability to listen to the show when I want to is awesome. This show is entertaining for people who live outside of the New Jersey area. They provide great insite into the restaurant industry. Great Job. An interesting look at the restaurant industry. Very entertaining. Mark and Francis show their vast knowledge of the restaurant business in their podcast. These guys love food and they love the restaurant business. Their passion for both is evident in each and every podcast, no matter what the topic. And what a variety of topics: trans fat to fois gras to restaurant reviews to getting your kids to eat veggies. There's truly something for everyone here. They are based in New Jersey but their philosophies about foods and wines are universally appealling. 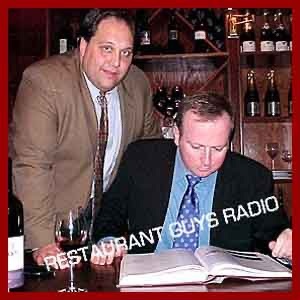 "The Restaurant Guys" succeeds where several other food podcasts fail for a number of reasons: 1) the volume level is generally consistent and easily understood; 2) they get interesting guests; 3) they do their homework so the guests are asked relevant questions; and 4) the conversation with the guests is flowing never sounds scripted. You have to get used to the fact that this is a radio show and they will cut a guest off midsentence when a commercial break or the news comes on (most of these are cut out on the podcast, but you still hear one commercial for their restaurant). However, they will return to that point when they come back. My favorites so far (I have only listened to around 30 or so episodes) are Thomas Keller, Anthony Bourdain, Secret Life of Lobsters (Corson), Heritage Farms, and Nina Planck. I listened to the interview with Doug Psaltis three times and think the guy got sandbagged. It was the only interview where I have seen these two offend someone and have them clam up. Usually they are so congenial, even when confrontational, which results in a very densely packed interview. Makes the 45-60 minute commute much more fun. Good podcast with a local information. Too bad they never respond to your email questions. I listen to these guys regularly. They use their connections to interview some great guests -- Anthony Bourdain and Bill Buford were outstanding recently. My one criticism is that they talk a lot -- sometimes talking over their guests, and repeating points several times. I've learned the remedy for that: fast forwarding when I hear Francis about to sum up a question or point for the second or third time. Other than that, I like their insider chats about the restaurant industry and their regular Jersey-guyness. I listen to this every day!!! I don't care if you are in the restauant business or not, these guys are just plain fun to listen to too...and you learn somethings along the way as well. I highly recommend this podcast. Topics range from Spanish wines to the overfishing for Chilean Sea Bass. Schott and Pascal have good chemistry, great connections to interviewees such as Thomas Keller, and a nice, relaxed but professional style. These guys have taken the talk show to an art form. Keep up the good work! Mark and Francis give a surprisingly good inside look on the restaurant business and food. Some things are fascinating and some a little scary to discover. Because the show's on a commercial AM station as well, the podcast isn't an amateur production. I've heard interesting guests from Anthony Bourdrain to Thomas Keller. I have no particular interest in Food Network, but I catch the Restaurant Guys every show. A must for a true foodie! I've been listening to this podcast since they first became available on itunes. Always entertaining and very informative. Even if your not in "the business" the dialog is witty and fun and you're sure to learn something in every podcast-at least I do! Keep up the good work guys! I am a original Chicagoan and I love you’re show. Not only do I get to learn about various foods and wines, I also get a refreshing perspective from the restaurant owners point of view which is great. Refreshing, insightful and at times rebellious with a touch of class. Pure poetry. Your show covers it all. Mark and Francis are industry insiders who use their expert knowledge to educate listeners on all things food and wine. They have enough wit to keep the hour entertaining and deep-dive knowledge that even professionals will find enlightening. Topics range from the mundane ("bad food trends") to the sublime (mad cow; sustainable farming). Worth the space on your iPod. I've been listening to various podcasts for over a year now and I always come back to this one. I listen to every new episode and have picked up a lot of tips and awareness on how to be a responsible foodie.